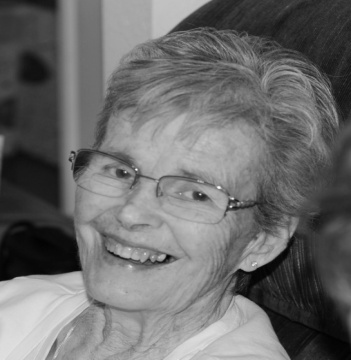 Anita Joy (Bradshaw) Reheis was born August 26, 1931 and passed away August 29, 2014. Anita is survived by her husband Paul Reheis, 5 children, Dan (Rena), Ben (Diane), Larry (Faye), Cari -deceased (Gerald Mickelson), Tami (Randy Nelson), Judi (Brad Haugen), 24 grandchildren, 35 great-grandchildren, and 1 great-great grandchild. Nita loved her family and was very good at sewing and crafts. She enjoyed camping and trips with her family. While fishing in Alaska she caught a (65 LBS) fish. Anita attended Mesa High and was twirler leader and known as “Bones” to her friends. The young men loved to dance with her because at 95 pounds she was very light on her feet. She was active in the LDS church and spent 16 years going to girls’ camp. Now she is in a happier place with a smile on her face with no more back pains. We will miss you mom and grandma. Visitation is Thursday, September 4, 2014 from 6-8:30 PM at the LDS Lazona Ward, 1345 E. University, Mesa, AZ. Funeral services are Friday, September 5, 2014 at 10 AM, preceded by a visitation from 8:30 to 9:30 AM, at the Vintage Ranch Ward, 2740 S. Lindsay, Gilbert, AZ. Burial at the City of Mesa Cemetery. Arrangements by Bunker’s Garden Chapel. So very sorry Paul and family! Anita always smiled and was always very “jolly” — It was obvious that she loved her life and her family. Please know that you and all of your family are in our prayers at this difficult time. We know that she is in a wonderful place with loved ones but at the same time it is hard to say goodbye– if only for a while. Our love to all! Dear Uncle Paul and family – Our thoughts and prayers are with you. Sorry we couldn’t be with you at today’s services; we are not in Arizona (mission). We will miss both Carrie and Aunt Nita. Both are great women! We are grateful for their examples and that they were able to be together right to the end. What a legacy of love! To Mrs. Reheis’ family, I’m very sorry for your loss. I wanted to offer you some comfort that I’ve found in the Bible. In John 11:25 Jesus said “I am the resurrection and the life. The one who exercises faith in me, even though he dies, will come to life.” It’s my hope that you can draw comfort and strength from this promise that we can see the loved ones we have lost again. Please accept my deepest condolences.